“Passion, love and respecting your targeted audiences are the main factors that guarantee the success of every new beginning,” according to Nikos S. Morantis, a Tourism Strategy Specialist and co-founder of the online platform Destsetters. Over the past seven years, Nikos and his Destsetters team have developed a number of successful tourism startups in Greece, which focus on the hotelier market. Among the projects, Travel by Interest and Hotelier Academy are the ones that stand out the most, as does their involvement in the strategic development of the 100% Hotel Show, the premium fair for hoteliers in Greece. But what exactly is the key to the success of a tourism startup? In this interview with GTP Headlines, Nikos talks about the ideal ingredients for startup success. 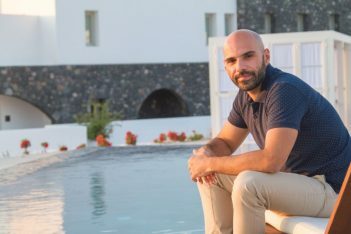 Nikos also gives us the backstory on how he managed, together with his team and without an initial budget, to develop the brands of Destsetters on a global level and work with some of the leading hotels and hospitality brands around the world. GTP: Nikos, can you please explain to our readers exactly what you do as a tourism professional? Nikos S. Morantis: In just a few words, we could describe my position as a Tourism Strategy Specialist, with a high expertise in hotels. More specifically, what I do is study the global hospitality market’s trends on the levels of Operation, Marketing & Sales, and specify projects that cover the needs of today’s hoteliers. This is something that I began working on after me and my business partner, Zenios Zeniou, developed with our team the Destsetters brand. GTP: According to your website, Destsetters currently has three different projects in its network. Can you tell us a bit more about the company? 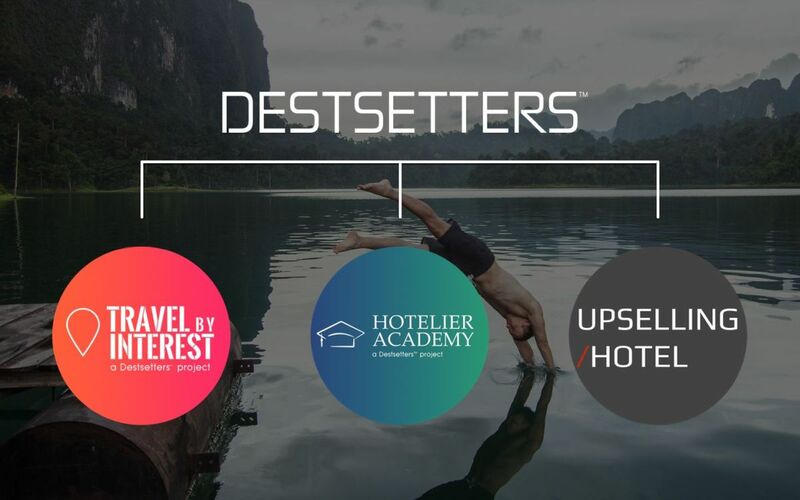 – Travel by Interest, which is the only online platform that helps hoteliers increase their direct sales, through the creation and distribution of targeted content. All the content that we create for our hotels includes the official booking engine of the properties directly connected, this way allowing potential guests to easily interact with the hotel. This is actually where our career began back in 2012 when we were the first to recommend targeting the powerful LGBT audience. We then extended our services to other niche markets, such as Gastronomy, Wellness, and Luxury. – Hotelier Academy, which is the first educational media for hoteliers and tourism professionals. In Hotelier Academy, useful hotel tips and advice can be found, as well as inspiring articles about special hotels, through our Hotel Stories and Case Studies. Our – not so secret – wish, is to make Hotelier Academy the global hospitality market’s entrepreneur! – Upselling Hotel, which is a premium and 100% personalized service, strictly provided by Zenios and myself. Upselling Hotel creates new hotel concepts as well as detailed personalized reports, explaining to hoteliers exactly how they can increase their restaurant, spa and other service sales. GTP: What exactly is your involvement with the 100% Hotel Show hospitality fair? Nikos S. Morantis: In collaboration with Demand, the organizing company of the 100% Hotel Show, we aim towards the fair’s strategic development. Also, by making use of Destsetters’ digital knowledge and experience, we give the event a truly special character. We are really excited to work on this project. This is because Demand is a company with an innovative vision on the organization of fairs, since every event that it organizes stands out for its special and contemporary character. Therefore, we are given the proper grounds to create a dynamic fair for hoteliers, that truly becomes a reference point for the entire market. Nikos S. Morantis: Exactly. Since we are talking about the success factors of a new tourism project, I must say that passion, love and respecting your targeted audiences are the main factors that guarantee the success of every new beginning. In order to create something truly inspired, you need to comprehend your audience’s needs and offer solutions and a broader vision. This is, indeed, a field where Destsetters and Demand share the same mentality – something that is reflected in the successful result of 100% Hotel Show. It may this sound a bit ’emotional’, but I believe that this is the only way in which you can stand out. GTP: Is it possible to create a tourism start-up without initial capital? Nikos S. Morantis: The truth is that having an initial budget to get you going, is always necessary. However, in our case, we started our business without any money. The key is to spot an actual need of the market and give an idea of covering it. After that, all you need to do is to find a small number of customers to start with, who will, of course, cover your initial financial needs, but also allow you to find the time to further develop and enhance your service. Even if you do spot an important gap in the market, if your funds are limited, you will not be able to offer the maximum of your services. But in any case, those first customers will always appreciate your continuous effort and improvement and will definitely support your hard work and persistence. GTP: In other words, a company can start running its business even if the full aspects of its services have not been completely defined yet? Nikos S. Morantis: But you must never feel that you have ‘completely’ defined something! There is always room for improvement. Otherwise, your job will become boring and outdated as time passes by. The important thing is to make the right start and have a clear goal. You will never be perfect… I remember, a few years ago, there were people wondering why we were constantly changing Travel by Interest’s main website. However, the feedback that we were receiving from out customers, was that they were excited with our continuous need for improvement and they were closely following our efforts. Also, the constant communication with our partners, showed us the way we needed to follow for our next steps. In other words, we strongly believe that our first project was developed together with our first hotelier customers. GTP: What you are saying brings the professional relationship into a more personal level. Is this something that you agree with? Nikos S. Morantis: Actually this could be a trap. Your first customers will definitely have a more direct communication with you and take up more of your time. However, you must never confuse the professional relationship with the personal one. In our team, we feel really close with the professionals that supported us in our first steps, but we have always had in mind that we need to maintain the required level of professionalism. To give you an example, every time we visit one of our customers’ hotel for business, we never make use of the property’s leisure facilities, not even at the personal time that we might have during the trip. GTP: Let’s get to know your team a little better. I can roughly estimate that the average age in your company is around… 26? GTP: So, you believe that experience is not important? Nikos S. Morantis: That depends on the job description and the needs that need to be covered. We prefer to give opportunities to younger people and assign them with important tasks, allowing them to develop into dynamic professionals. Zenios and myself have been very lucky, since at the age of 26 and 24, important professionals gave us important tasks and opportunities. All you need to do is seize the opportunities and work really hard on them! GTP: And how do you define ‘opportunity’? Nikos S. Morantis: To answer your question, I must refer to my professional ‘parents’, the people who gave me the proper urge, on a practical as well as psychological level. I am talking about my professional ‘mother’, Alina Tsolakaki, who has created, among others, the successful company Aqua Vista Hotels, as well as Dimitris Antonakos, organizer of 100% Hotel Show. These two people, in addition to the important business opportunities they gave us, had such a powerful belief in us, that made us want to try harder every time, in order to stand up to the really high standards they were setting. And this is exactly where we should focus: on the fact that the true opportunity is actually the challenge of standing up to the high expectations that people who believe in you and your vision, have. GTP: Finally, how should a start-up make its future budgeting? Nikos S. Morantis: In my opinion, it should be done spontaneously. Every time you begin a new project, you need a lot of energy, creativity and constant investments. New professionals, and especially those without a budget, must realize that in addition to making the necessary money for living, they must first invest in expanding their vision and service. 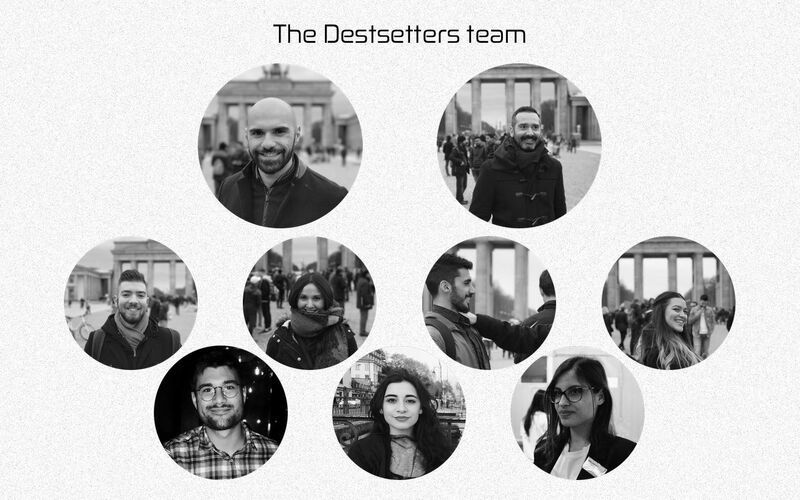 It is no secret that at Destsetters we always focus on new investments. This has proven very successful so far, since the whole network of Destsetters is now enjoying an increased value. Nevertheless, after a certain point, you need to be more careful in handling the financial aspect of your company, without, of course, rejecting any new opportunities that come along the way. GTP: What are your future plans? Nikos S. Morantis: We plan to make Travel by Interest the leading Content Generator for hotels and make Hotelier Academy a reference point for hotel education and trend updates. We will also aim to develop some of the most powerful and recognizable hotel concepts with Upselling Hotel. 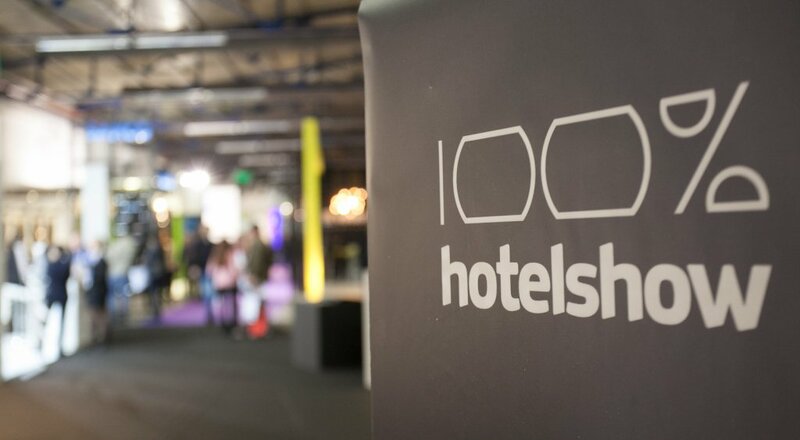 We also have big plans for the 100% Hotel Show, as we want to make it one of the most important fairs for hoteliers in Europe. As you can see, our goals are always high. However, we have the expertise, the experience and the passion for hard work to achieve them. And even then… we still won’t stop! 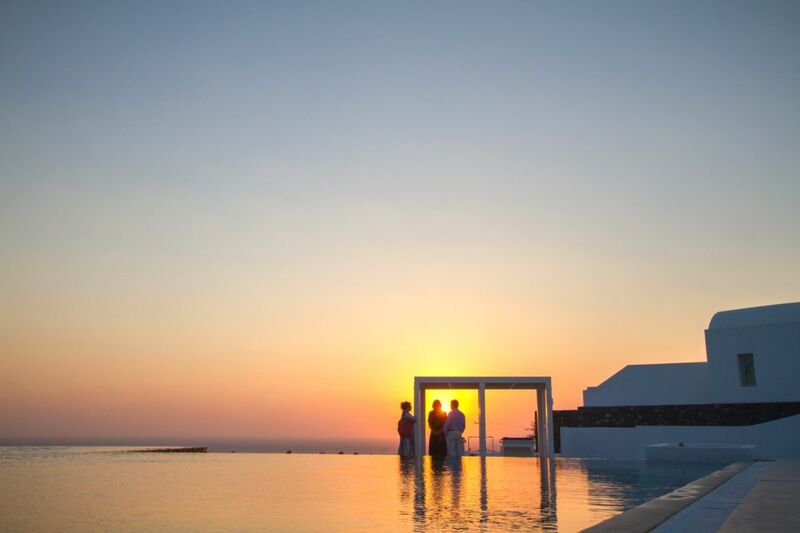 ***Nikos’ photoshoot took place at the Santo Maris, a dynamically rising luxury resort on the island of Santorini, by Greek photographer Panos Barous, who specializes in Santorini portraits.